The design is professionally painted by hand onto 13 mesh mono Zweigart needlepoint canvas. You can purchase this as canvas-only or with fibers. If you select cotton we will send you DMC embroidery floss; if you select silk we provide Planet Earth Pepperpot which is single ply. If you'd like to add some subtle sparkle, we add Glisten by Rainbow Gallery to your silk selection. To keep the canvas taut we recommend a pair of 14" and a pair of 16" stretcher bars and some thumb tacks. 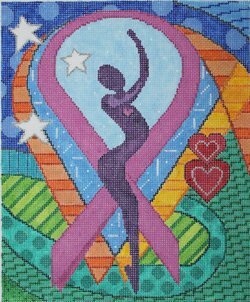 If you have any questions about this JulieMar needlepoint please contact us. We are always happy to help and we try to reply promptly. This design usually ships in approximately 7-10 days. If it is out of stock we will let you know and you can cancel your order if you do not wish to wait. Sandra Gilmore Needlepoint "Shopping Spree"